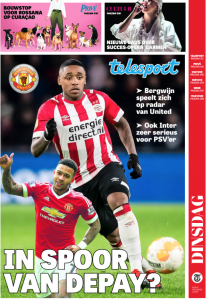 The front page of De Telegraaf’s sport section on Tuesday is all about Steven Bergwijn. Well, it’s a little about Memphis Depay too, but that link is merely down to the possibility of Bergwijn following the same career track, and ending up at Manchester United. Of course, it would be hoped that if the transfer happened it wasn’t then followed by a relatively quick move to Lyon, but the link is made anyway. Bergwijn is 21 years of age and plays for PSV, just like Memphis did, and has a contract lasting until June 2022. In seventeen Eredivisie matches so far this season, he’s scored nine times and provided a further eight assists. For balance, in the Champions League he has five starts and has contributed one assist. PSV’s group in Europe was very difficult, facing Barcelona, Tottenham and Inter Milan. It’s the Italian club who he got the assist against, in a 1-1 draw, and they’re also presented as keen. De Telegraaf say Manchester United watched the youngster in action on Sunday, in a 2-2 draw with FC Emmen. The Premier League club are ’emphatic’ with their interest and becoming ‘increasingly convinced’ about the Netherlands international. 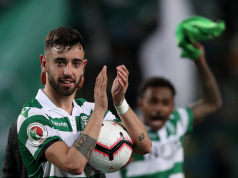 He won’t be going anywhere this month, and the Dutch newspaper say his price tag is now ‘significantly higher than the €20m PSV would have accepted last year. Berwijn is a right footer, who has been playing mainly on the left wing, but can operate anywhere across the front three.